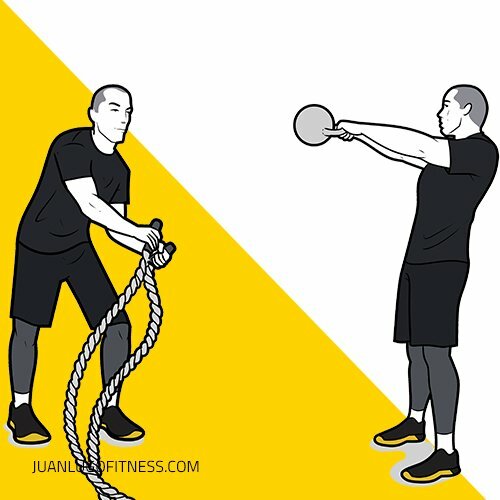 Battle ropes AND Kettlebell Swings in one workout?!! I know what you’re thinking. This must be a tough workout. And you would be right, it is. I wanted to design a heart pounding workout and I needed two explosive movements that together would provide a very pronounced metabolic effect. To be more specific, an EPOC effect. Epoc or Excess Post-exercise Oxygen Consumption is a state where the body continues to use oxygen for various metabolic processes following an intense training bout. The keyword there is intense. You will have four different EMOM workouts to choose from. EMOMs are one of the best training protocols to improve cardiovascular endurance. The goal for this workout is not to have a long and drawn out cardio session. 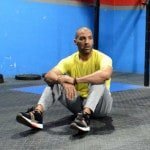 So don’t be surprised to see a 8 minute workout at the end of this article. There’s tons of battle rope movements or patterns to perform. Once you feel comfortable with basic waves, you can move on to more complicated movements like the one above. I am essentially performing a single battle rope slam and then proceeding into a burpee (but notice that I don’t do a jump in this particular burpee). If the push up portion is too much for you, just simply do the burpee without the push up. If you’ve visited my blog before you would probably notice I love kettlebell swings. And rightly so. They provide a fantastic total body workout. The best part of kettlebell swings is that you don’t need a lot of space to perform them. Watch this video to learn how to import the timers from you mobile browser to your phone (iPhones only) using the Seconds Pro App.